Control and Optimization of UAV Trajectory for Aerial Coverage in Photogrammetry Applications, POPESCU, D., STOICAN, F., ICHIM, L.
A Novel Approach for Activity Recognition with Down-Sampling 1D Local Binary Pattern Features, KUNCAN, F., KAYA, Y., KUNCAN, M.
A New Systolic Array Algorithm and Architecture for the VLSI Implementation of IDST Based on a Pseudo-Band Correlation Structure, CHIPER, D. F., CRACAN, A., BURDIA, D.
Active Frequency Stabilization Method for Sensitive Applications Operating in Variable Temperature Environments, DONE, A., CAILEAN, A.-M., GRAUR, A. Mobile@Old: A Smart Home Platform for Enhancing the Elderly Mobility, MOCANU, I., SCHPOR, O.-A., CRAMARIUC, B., RUSU, L.
ABC Algorithm based Fuzzy Modeling of Optical Glucose Detection, SARACOGLU, O. G., BAGIS, A., KONAR, M., TABARU, T. E.
NICOLAICA, M.-O. , TARNICERIU, D.
The current paper presents a new virtual analysis method that is applied both on hybrid and electric vehicle architectures with the purpose of contributing to the improvement of energy efficiency. The study is based on Matlab modeling and simulation. A set of parameters are considered in order to assess the system performance. The benefit is given by the comparative overview obtained after the completed analysis. The effectiveness of the analysis method is confirmed by a sequence of simulation results combined in several case studies. The impulse of the research is given by the fact that the automotive market is focusing on wider simulation techniques and better control strategies that lead to more efficient vehicles. Applying the proposed method during design would improve the battery management and controls strategy. The advantage of this method is that the system behavior with regards to energy efficiency can be evaluated from an early concept phase. The results contribute to the actual necessity of driving more efficient and more environmental friendly vehicles. G. Livint, V. Horga, D. Sticea, M. Ratoi, M. Albu, "Hybrid Electric Vehicle Experimental Model with CAN Network Real Time Control," Advances in Electrical and Computer Engineering, vol. 10, no. 2, pp. 102-107, 2010. Y. Gao, M. Ehsani, J. M. Miller, "Hybrid electric vehicle: overview and state of the art," IEEE International Symposium - Industrial Electronics, pp. 307-316, Dubrovnik, Croatia, 2005. X. Hu, S. Li, H. Peng, "A Comparative Study of Equivalent Circuit Models for Li-Ion Batteries," Journal of Power Sources, vol. 198, pp. 359-367, 2012. M. Ehsani, Y. Gao, S. E. Gay, A. Emadi, "Modern Electric, Hybrid Electric, and Fuel Cell Vehicles", pp. 48-50, CRC Press, 2005. N. Kim, S.W. Cha, H. Peng, "Optimal Equivalent Fuel Consumption for Hybrid Electric Vehicles," Control Systems Technology, IEEE Transactions, vol. 20, pp. 817-825, May 2012. L. Lu, X. Han, J. Li, J. Hua, M. Ouyang, "A Review on the Key Issues for Lithium-Ion Battery Management in Electric Vehicles," Journal of Power Sources, vol. 226, pp.272-288, 2013. A. Panday, H.O. Bansal, "A Review of Optimal Energy Management Strategies for Hybrid Electric Vehicle," International Journal of Vehicular Technology, vol. 2014, 19 pages, 2014. S. Miller, "Hybrid-Electric Vehicle Model in Simulink #28441," Matlab Central, August 2010. F. Wu, T. Yeh, C. Huang, "Motor control and torque coordination of an electric vehicle actuated by two in-wheel motors," Mechatronics, vol. 23, no. 1, pp. 46-60, 2013. N. Bouchetata, M. Bourahla, L. Ghaouti, "Behavior Modeling and Simulation of Double Wheeled Electric Vehicle Drive," Przeglad Elektrotechniczny, vol. 88, no. 10A, pp. 218-223, 2012. S. Haghbin, K. Khan, S. Zhao, M. Alakula, S. Lundmark, O. Carlson, "An Integrated 20-kW Motor Drive and Isolated Battery Charger for Plug-In Vehicles," IEEE Transactions on Power Electronics, vol. 28, no. 8, pp. 4013-4029, 2013. D. Hamza, M. Pahlevaninezhad, P. K. Jain, "Implementation of a Novel Digital Active EMI Technique in a DSP-Based DC-DC Digital Controller Used in Electric Vehicle (EV)," IEEE Transactions on Power Electronics, vol. 28, no. 7, pp. 3126-3137, 2013. C. C. Chan, K. T. Chau, "An Overview of Power Electronics in Electric Vehicles," IEEE Transactions On Industrial Electronics, vol. 44, no. 1, February 1997. 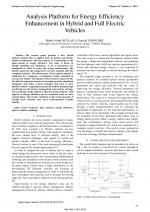 W. Li, G. Xu, H. Tong, Y. Xu, "Design of optimal, robust energy management strategy for a parallel HEV," IEEE International Conference Robotics and Biomimetics, 2007. ROBIO 2007. F. R. Salmasi, "Control Strategies for Hybrid Electric Vehicles: Evolution, Classification, Comparison, and Future Trends," IEEE Transactions on Vehicular Technology, vol. 56, no. 5, pp. 2393 - 2404, September 2007. R. Hodkinson, J. Fenton, "Electric motor and drive-controller design," Automotive Engineering Series, pp. 56-79, 2000. B. Tabbache, A. Kheloui, M.E.H. Benbouzid, "Design and control of the induction motor propulsion of an Electric Vehicle," Vehicle Power and Propulsion Conference (VPPC) IEEE, pp. 1-6, 2010. S. C. Oh, "Evaluation of motor characteristics for hybrid electric vehicles using the hardware-in-the-loop concept," IEEE Transactions - Vehicular Technology, vol. 54(3), pp. 817-824, May 2005. Z. Xiaowei, H. Hongwen, X. Rui, "Hardware in loop simulation for vehicle controller in hev based on dspace," Advanced Computer Theory and Engineering (ICACTE), 2010 3rd International Conference, vol. 2, pp. 489-492, August 2010. 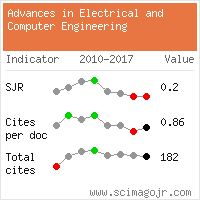 Citations for references updated on 2019-04-21 13:17 in 121 seconds. Website conception, design and maintenance by Eugen COCA. Content updated on 28 Feb 2019. Site engine updated on 28 Feb 2019. This page was generated on the server in 0.074 seconds and loaded in your browser in > seconds.